There are growing calls on the Governor of Rivers State, South-South Nigeria, Mr. Rotimi Amaechi to account for how his administration spent appropriated funds totaling over Five Hundred Billion Naira about $3.6billion in the last two years. But many of Governor Amaechi's critics would no longer have to wait endlessly for a convincing account on how the money for the state was spent or misappropriated. There are reasons to believe that Nigeria's neighboring countries are benefitting hugely from the funds disappearing from Rivers State. According to credible sources, part of the money that Amaechi is struggling to reconcile in the books may have actually gone into providing funds for the ruling party in Ghana, an alleged contribution to the election of incumbent Ghanaian President, John Atta Mills. A whopping Four Hundred Million, about $3.5 million was allegedly transferred to facilitate the process in Ghana. While the world celebrates Ghana as a beckon of free and fair democracy in Africa, there is no mention of the country, Nigeria that provides the money that produces the miracle of Ghana. Former Ghanaian dictator, Flight Lt. Jerry John Rawlings (Retired) has been identified as the alleged conduit through which the huge sums were transferred to the ruling party in Ghana. Rawlings has been a regular visitor to River State. Another individual identified as a courier for Governor Amaechi is one Nyeson Wike, an aide to Amaechi. While Nigeria continues to face massive de-industrialization, Amaechi is said to have also invested several millions in Blue chip companies in Ghana. He and other Governors in Nigeria are said to have devised a new strategy of investing stolen loots from Nigeria to neighboring countries and Ghana with its seemingly stable economy has become a favored destination. In the last one year, Amaechi is said to have starched away over N1 Billion to selected companies in Ghana, in a manner designed to beat the watchful eyes of Economic and Financial Crimes Commission (EFCC) who are still investigating the State for money laundering. Recently, a group known as Niger Delta Watchdog asked the Governor to account for over N500 Billion that accrued to the state in the last two years, he could not do so convincingly. But sources said that most of the money may have been taken to Ghana where the Governor has sizeable amount of investment. Amaechi is said to be using one Wike who operates an account with Zenith Bank with Number 602-500-949 in Port Harcourt as one of the cronies who launder money on his behalf. Wike, before his present ordeal with the EFCC, is said to have ran errands for Amaechi mostly in Ghana and other countries the Governor has interest in. "How is it possible for a one kilometer road to be constructed at N4.3 billion and a five-kilometer road at N7.3 billion? We want to know what kind of roads will cost this much?" The watchdog also doubts the sincerity in the proposed building of 105 cottage hospitals spread across the 23 local government areas (LGAs) in Rivers state. The group hinged its argument on the ground that four cottage hospitals per LGA is a waste when most of the Local Government Areas of the state have standard General Hospitals that need refurbishing. They want the government to rather refurbish the existing hospitals. Quoting Alhaji Asari Dokubo, "Contract regime and looting are correlated", the group accused the government of going on contract spree such as the N48 billion (more than $400, 000, 000.00) for the refurbishing of Trans Amadi/Omoku Gas turbine. With N11 billion already paid out. According to them, the Federal Government anti-graft bodies should investigate all contracts approved in the last one year. Already, the EFCC is investigating the Chief of Staff to the Governor, Mr. Nyeson Wike and the Secretary to the State Government, Mr. Magnus Abe over illegal transfer of over N100 million, while invitation has been extended to the Commissioner for Finance and the Accountant- General over the same allegation. Governor Amaechi is not new to controversies concerning looting and embezzlement of State Finances. He was grossly carpeted by the EFCC for allegedly presiding over a corrupt House of Assembly during the Governorship of Mr. Peter Odili. In 2006, a whooping N250 million was budgeted for foreign trips for the members. And what do the members do on such trips? A missive from Rivers Net, the company that organizes most of the tours, throws some light on this. In July, the company said it obtained a grant from Miami-Dade County to help organize a two–week visit by members of the Rivers State House of Assembly to Miami, Florida in the United States. Their itinerary included listening to presentations by Pete Hernandez, deputy county manager, Joe Roscoe, director of international affairs, and Tony Okonmah, executive director, Foundation for Democracy. It also included a tour of Miami International Airport and Port of Miami where they were given special presentations on the two facilities. 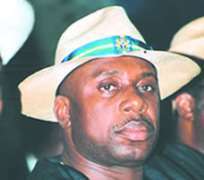 According to an EFCC's report, Amaechi wrote to the then Governor Odili, asking him to approve $346,000 for a guided tour for all the members. By his calculation, going by the exchange rate then of N145 to the dollar, this amounted to N50,170,000. The governor approved N50 million. However, Amaechi and his colleagues ripped off the government. First, even if every member were to go for the trip, it would have cost $176,000 and not the $346,000 that was collected. Also, it was discovered upon investigation that the members went only to South Africa. They left for Johannesburg on December 7, 2003, and returned to the country on December 12, 2003 without going to Kenya. But nobody refunded money to government coffers. Another way by which the legislators siphon money from public purse was through budgetary allocation called “Constituency Office and Clean Up”. In 2005, N276 million was budgeted under this sub-head (N220 million was eventually approved for payment by the state Governor) while N136 million was budgeted in 2006 (the governor approved N120 million). But it was discovered to be just an avenue to loot. The money was shared among members and nothing was done in the constituencies. In 2005, Amaechi alone got N16.7 million while his deputy got N11 million. On September 6, 2006, the Rivers State House of Assembly put N100 million in a call account at Zenith Bank, Port Harcourt. The instruction was that at maturity, the money and the accrued interest would be rolled over. However, on September 11, 2006 the assembly wrote to terminate the call account and asked for the release of N60 million “for a conference holding in Port Harcourt”. On September 12, 2006, being the next day, it further asked for the release of N5 million again “for a conference holding in Port Harcourt”. Later the same day, the House wrote again for the bank to release N10 million, still “for a conference holding in Port Harcourt”. Finally, on September 14, 2006, the balance of N25 million was collected for the same purpose. Alex Kalagbor, the cashier in the House, collected all the money. The EFCC was interested in knowing what kind of conference could have cost N100 million. Officials of the commission say that some of the money has been traced to Amaechi. But a top PDP Chieftain in the state said last week that Amaechi is a victim of the power play between the Odili camp and the Governor's opponents. He said, “They are doing this to stop what they believe is a growing Odili political dynasty”. According to him, those powerful interests petitioned against Amaechi to get at Odili. But by the time the party saw the findings of the EFCC, it had no choice but to drop the Speaker. Notwithstanding the motive of the petitioners, the commission has said that it would neither succumb to blackmail. The then EFCC Chairman, Mr. Nuhu Ribadu, unsuccessfully tried to bar Amaechi from the Governorship race that has culminated in his present position.